"Perthshire, east-midland co. of Scotland, bounded N. by Inverness-shire and Aberdeenshire, E. by Forfarshire, SE. by Fife and Kinross-shire, S. by Clackmannanshire and Stirlingshire, SW. by Stirlingshire and Dumbartonshire, and W. by Argyllshire; greatest length, E. and W., 72 miles; greatest breadth, N. and S., 60 miles; the detached portion (lying along the upper reach of the Firth of Forth, and separated from the main body by a belt of Fife and Clackmannanshire) is 6½ miles by 4½ miles; area, 1,617,808 ac. ; pop. 129,007. Perthshire includes some of the grandest and most beautiful scenery in Scotland, combining features characteristic both of the Highlands and the Lowlands. The ranges of the Ochils and the Sidlaw Hills, which are parted by the estuary of the Tay, occupy the SE. ; while the N. and NW. districts, to the extent of more than one-half of the entire county, are occupied with the mountains of the Grampian system, this Highland region being intersected by numerous lochs and glens." From John Bartholomew's Gazetteer of the British Isles, 1887. Perthshire (Siorrachd Pheairt), is a highland county located in central Scotland. And, along with Kinross, Aberdeenshire, Angus, Inverness, Argyll and Bute, Moray, Stirling and Isle of Arran, is one of eight areas with the Highland Council’s administration. A local administrative county between 1890 and 1975, Perthshire extends from Strathmore in the east, to the Pass of Drumochter in the north, Rannoch Moor and Ben Lui in the west, and Aberfoyle in the south. Perthshire offers a wide range of landscapes from agricultural straths to the high mountains of the southern Highlands giving it the descriptive name "big county”. The Highland Council is the administrative body for much of the Highlands, with its administrative centre at Inverness. However, the Highlands also includes parts of the Perth and Kinross council areas. The coat of arms of the County of Perth appears to have been granted for use on the colours and standards of the volunteer and militia units of the county raised at the end of the eighteenth century. 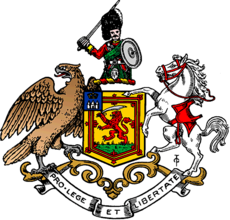 The Earl of Kinnoull, a native of Perthshire, and commanding officer of the Perthshire Gentlemen and Yeomanry Cavalry, was also Lord Lyon King of Arms at the time, and he presented the arms to the county in 1800. The grant document was discovered in the Lyon Office in 1890, and forwarded to the newly formed Perth County Council. Image courtesty of Wikipedia. The A K Bell Library, Perth including its Local Studies department. Central Library Dundee and its Newspapers, Periodicals and Magazines held in the local history library. Dundee City Archive & Record Centre. Dunkeld Cathedral Chapter House Museum. National Records of Scotland - you can search for just about any type of record via this site. Mitchell, J. F. & Mitchell, S., Monumental inscriptions (pre-1855) in North Perthshire and Monumental inscriptions (pre-1855) in South Perthshire (1975 and 1974, Scottish Genealogy Society). A new edition has been printed, with corrections, as a 4 volume set, available from Tay Valley FHS, the Scottish Genealogy Society and others. Monumental Inscriptions are being collected by Tay Valley FHS, who are also involved in the Scottish National Burial Index. Information on obtaining burial records held by Perth & Kinross Council. If your relatives were buried in Wellshill Cemetary you may be able to locate the grave using their location tool. There is also a listing of war casualties that were buried in Wellshill on the Commonweath War Grave Commission website. Ford Road Cemetary has a photo library of gravestones as well as surname lists and lists of monuments. There has been a census every ten years since 1801, excluding 1941. The earliest for practical purposes is usually 1841 and the latest that is currently available is for 1911. Scottish census returns are held by the Registrar General. Microfilm copies are held locally by Tay Valley FHS, the LDS Family History Centre, Dundee, and A K Bell Library, Perth and can also be ordered at LDS Family History Centres around the world. Indexes and images for census records from 1841 to 1911 are available and searchable online at Scotland's People. Old Parish Registers for Church of Scotland congregations are are held by the Registrar General. Microfilm copies are held locally by Tay Valley FHS, the LDS Family History Centre, Dundee, and A K Bell Library, Perth and can also be ordered at LDS Family History Centres around the world. Kirk Session records (Church of Scotland) are with the National Archives of Scotland, although parts are sometimes on OPR microfilms. Non-Church of Scotland Registers are more problematic. Some may be found in Perth & Kinross Archive or in the National Archives of Scotland. It is often worth doing a search at the National Register of Archives for specific localities. For information on records for a particular parish, please see the appropriate parish page. Perthshire Parish Records on the British Birth, Marriage and Death records website has more parish information for the area. This website gives baptismal records back to the 1500's. Registration of Births, Marriages and Deaths began in Scotland on 1st January 1855. Certificates are held by the Registrar General and can also be ordered through Scotland's People. A variety of local court records are held by Perth & Kinross Archive. Records of sasines, testaments, inventories etc. are held at the National Archives of Scotland. The Visit Scotland has a comprehensive guide to the county. Undiscovered Scotland has a collection of information about the area, including accomodation, local business and places of interest. Click on place names on the map to home in. Balquidder Kirk is a lovely old church built near the ruins of the original church. It has been a place of worship for members of Clan MacLaren for the past 900 years and is also the location of the grave of Rob Roy and some of his family. These articles or short essays, on Scots migrants & emigrants and other topics, include people from Perthshire. Perth County Pioneers has accounts of former tenants of the Breadalbane estate. More about Perthshire from The Gazetteer of Scotland by Rev. John Wilson, 1882. The description of Perthshire from The National Gazetteer (1868). Transcribed by Colin Hinson. © Copyright Colin Hinson, 1999-2010, &c.
The Perthshire website has a listing of Clan and Family names of Perthshire. Perth and Kinross Council Records - This site offers a wide range of resources and has some really good information. For example, under the Jacobites in Perthshire, it gives records of dates of appointment and a listing of the names of the men who were appointed by the magistrates to guard the town. Family Search wiki has some information about Perthshire as well as links to records. There are a variety of different kinds of records on this page - census, probate and poorhouse records. Another general resource comes from the Perthsire Geneology page of the geneologylinksnet.uk website - a collection of links to a variety of different geneology resources. See Regalities and Baronies for more information about Perthshire's history of geographical boundaries. Historical information about Perthshire from Visit Scotland. The history of the Strathearn area. The Dundee History Group also covers the Perthshire area. Most major records relating to land ownership are held nationally, so look at the entry on the main Scotland page. Perth & Kinross Archive hold a range of different records relating to local property. Various maps of Perthshire have been put online by the National Library of Scotland. A wide selection of maps and plans are held by A K Bell Library, Perth. First edition Ordnance Survey maps are available online from the Landmark Information Group. View details of current newspapers. Back issues of local newspapers are held by A K Bell Library, Perth. Inns and Innkeepers in the Carse of Gowrie, 1806. According to the Family Search wiki page, there were three poorhouses in the Perthshire area. There is a general page that has informationi about workhouses in the UK and that can be found here. Friends of Perth & Kinross Council Archive. Dunkeld & Birnam Historical Society. Moulin & Pitlochry Historical Society (includes archives of the Moulin & Pitlochry History Circle. More detailed information about Perthshire towns and parishes.